This is the fourth episode in Molly and Sara’s new podcast series Living Fearlessly. Each week, they will dive deeper into the things that we can all do to live fearlessly for ourselves and our soul growth. 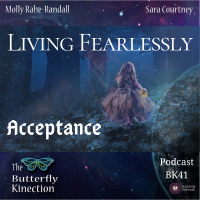 This week, Molly and Sara’s topic is Living Fearlessly-Acceptance. They talk about accepting others for where they are at so we can begin to find the courage and strength to move forward and accept ourselves. Molly and Sara discuss how easily our focus can be shifted to what others are doing when we are not wanting to face what we are not doing for ourselves. People reflect back what we wish we were taking the time to do. We need to see others for where they are at and accept and support them along their journey. Then we can begin to focus on accepting ourselves.